What are the Chances They’ll Fire These Things Off? In this phone conversation just hours before his speech to the nation on October 22, 1962, President Kennedy updates former President Dwight Eisenhower on the latest Cuba developments. 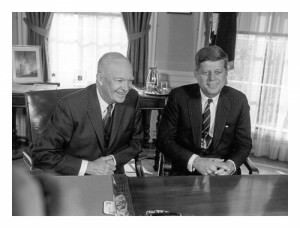 Kennedy had made sure that Eisenhower had been briefed regularly throughout the crisis, often by Director of Central Intelligence John McCone, who had been chairman of the Atomic Energy Commission in the Eisenhower administration. As a leading figure in the Republican party, Eisenhower had criticized the Kennedy administration in sometimes harsh terms. In this call, Kennedy makes sure to get Eisenhower to say he would do the same thing under the circumstances. Dwight Eisenhower Well, I thank you for telling me. And I will, I personally, I think you’re really making the only move you can. JFK Yeah. It’s tough to . . . As I say, we will, I don’t know, we may get into the invasion business before many days are out. JFK But . . .
Eisenhower Of course, from the military standpoint that’s the cleancut thing to do, now. JFK That’s right. That’s right. Eisenhower Because you’ve made up your mind you’ve got to get rid of this thing. Eisenhower —of others, why you’ve got to do it a little slower. JFK Well, Berlin is the . . . I suppose, that may be the . . . what they’re going to try to trade off. Eisenhower Well, they might. But I, personally, I just don’t quite go along, you know, with that thinking, Mr. President. Eisenhower My idea is this: The damn Soviets will do whatever they want, what they figure is good for them. Eisenhower And I don’t believe they relate one situation with another. Eisenhower Just what they find out they can do here and there and the other place. Eisenhower And, we’re already standing as a unit with NATO, that if they go into Berlin, that’s all of it. Eisenhower That means they’ve got to look out that they don’t get a terrific blow to themselves. Eisenhower And I don’t . . . It might be, I could be all wrong. But my own conviction is that you will not find a great deal of relationship between the two. Eisenhower They’ll try to make it that way. JFK Yeah. General, what about if the Soviet Union—Khrushchev—announces tomorrow, which I think he will, that if we attack Cuba that it’s going to be nuclear war? JFK And what’s your judgment as to the chances they’ll fire these things off if we invade Cuba? Eisenhower Oh, I don’t believe that they will. JFK You don’t think they will? JFK In other words you would take that risk if the situation seemed desirable? Eisenhower Well, as a matter of fact, what can you do? Eisenhower If this thing is such a serious thing, here on our flank, that we’re going to be uneasy and we know what thing is happening now. All right, you’ve got to use something. Eisenhower Something may make these people [the Soviets] shoot them [their nuclear missiles] off. I just don’t believe this will. Eisenhower In any event, of course, I’ll say this: I’d want to keep my own people very alert. JFK Yeah. [Chuckles some more.] Well, we’ll hang on tight. Eisenhower [also chuckling a bit] Yes, sir. JFK Thanks a lot, General. Eisenhower All right. Thank you. Transcript from Ernest May and Philip Zelikow, eds., The Presidential Recordings: John F. Kennedy, vol. 3 (New York: W.W. Norton, 2001), pp.14-15. How Much is Redacted from the JFK and LBJ Tapes? How Much Did the Cuban Missile Crisis Cost? Spare a Dollar to Help Win the Cold War? by David Coleman. W.W. Norton & Company, 2012. © 2016 David Coleman | Contact.